Seems like a lot of times the metal plate for the front panel gets bent from the amp being taken in and out of the chassis for servicing. This one is so perfect I wonder if it has ever even been wrangled from the chassis. Either that or kind persons have babied it. Kind of a museum piece. Old caps date it to 1973. Sadly the streak of original is over. 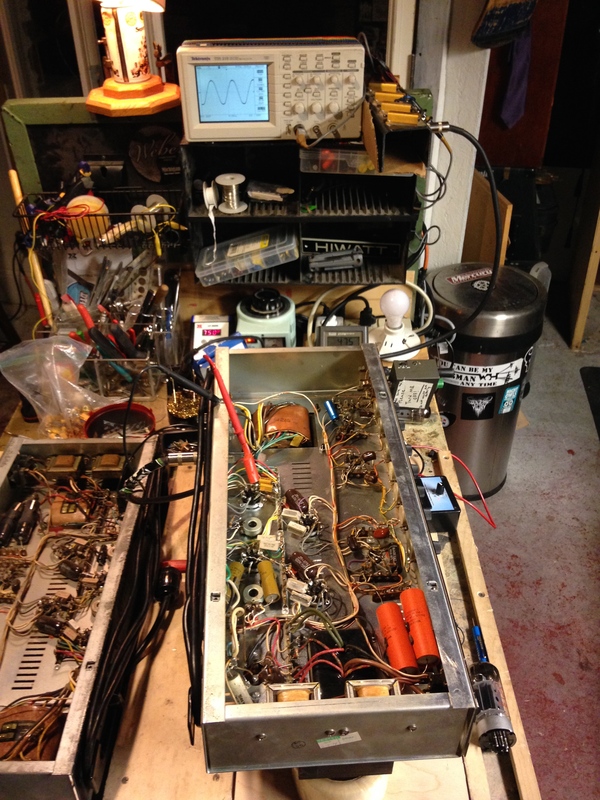 A power tube died and took out the plate and screen grid resistors with it. 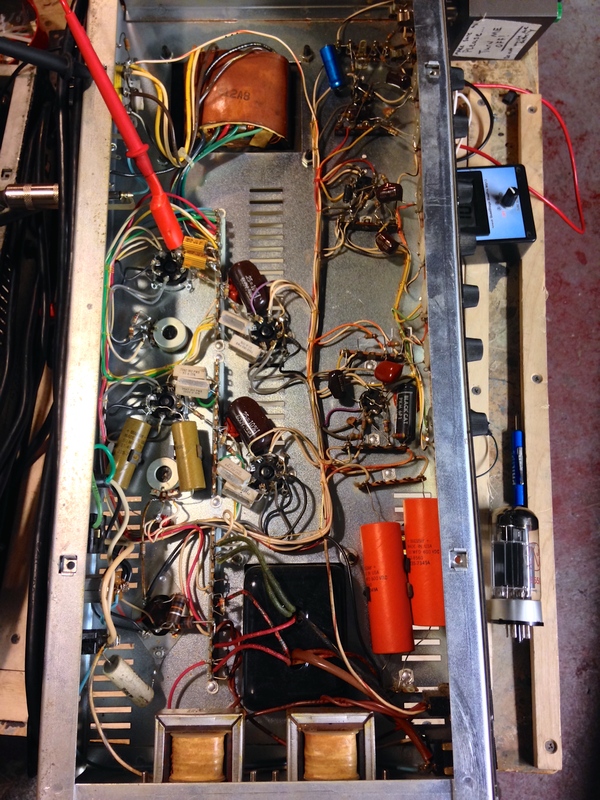 You can see they are replaced with the heat sink style 10W resistors where the multimeter lead is clipped on the tube socket. Other than that this thing seems to be untouched. It’s not even dusty inside because the owner has the Sunn slip cover that came with the amp. 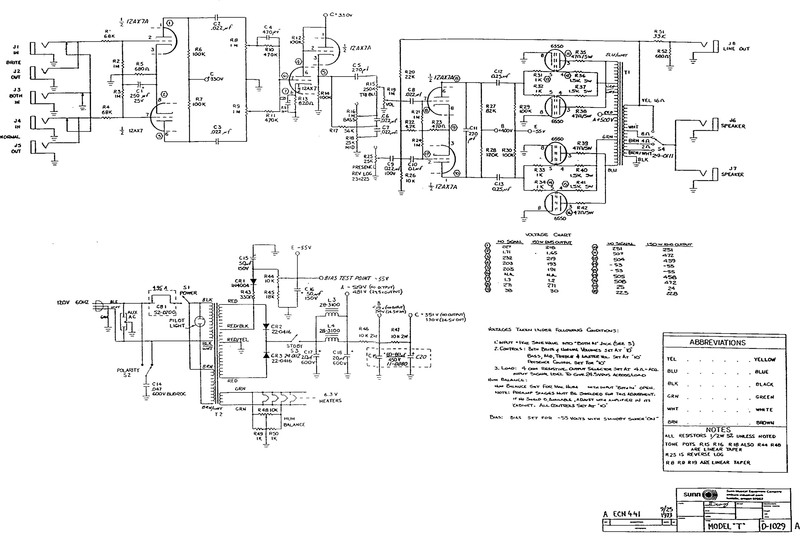 Sunn Model T schematic. There is a bit of a misleading thing about this schematic I’ve realized — at the A, B and C power supply nodes it lists voltages at idle as well as with 24.5VAC output into 4 ohm load. 24.5 x 24.5 / 4 =150W output. 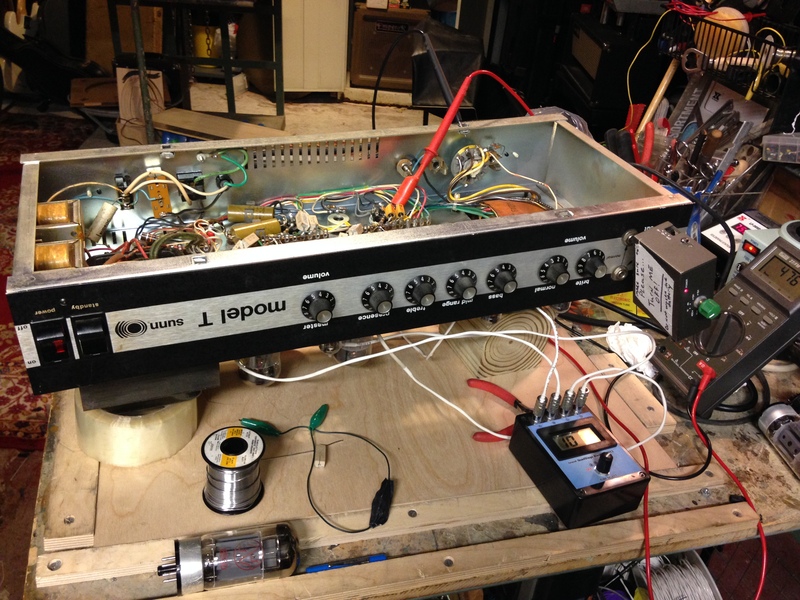 This is also listed at the chart below the power tubes that lists the test point voltages as 150W RMS. This amp is called a 150W amp but it really only does 120-130W at clipping, and this is normal. Sure it can reach into 150W territory but only with lots of distortion. Reissue Sunn Model T released by Fender in the 90s does 105-115W clean also, and it uses 6L6s in the output section, which is NOT ultralinear. I’m actually surprised the original Model T cannot do more power with KT-88s and ultralinear OT, which is known to be a lower distortion output topology, AND higher plate voltage by about 40V than reissue Model T. Someone please bring me one of those not-as-coveted silverface Fender Twin Reverbs with ultralinear output section that supposedly does 135W with 6L6s. Is it actually true?? ?